Using the Chart Module to display information held in a DataSet. 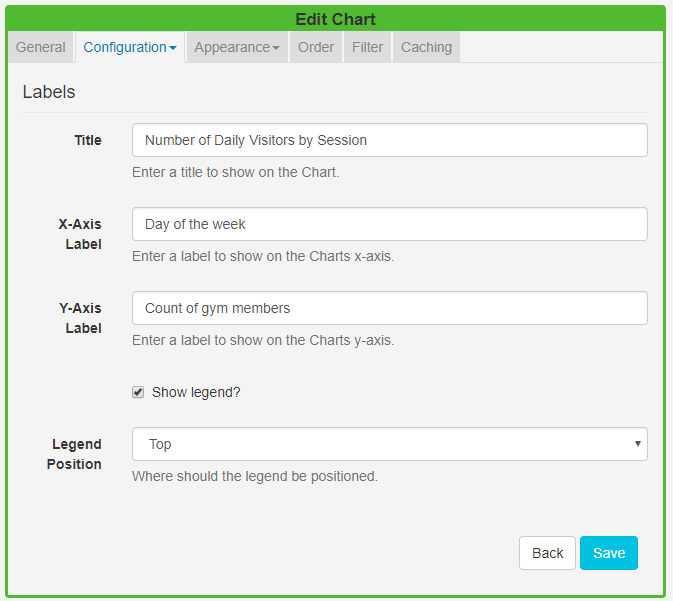 This tutorial will walk you through how you can produce a Layout to include a chart to show how many gym members visit per session for a week, using my fictitious gym ‘Spring Leisure’. First, we need to create and define a DataSet to use. Log in to your CMS and click on DataSets under the Library section of the main menu. Click on the Add DataSet button and give it a name and Save. Click on the row menu for the DataSet and click on View Columns. One column (Col1) has already been added by default, use the row menu to Edit. Using the Add Column button repeat the above steps for ‘Session’ and set a Column order of 2. Repeat the above steps for ‘Count of members’ but this time change the Data Type to ‘Number’ and set a Column order of 3. Next, we need to add some data to our DataSet. For this example, I have manually entered my data but you could choose to import data directly in from a CSV file, which could also come from another system. Click on the View Data button, then Add Row. Complete data so that you have each day of the week, with a Morning, Afternoon and Evening session completed with a number included to represent the count of members. Use the Next button to complete all days and all sessions. You can make edits to the data by clicking anywhere on the row you wish to amend and saving changes. You should now have a structured DataSet with data that you can use to include the Chart module in a Layout! Add an image or choose a coloured background. Click on the edit icon in the top right corner of the Layout Navigator window, and resize and position your Region. Click on Widgets on the bottom toolbar and drag or click to add the Chart Widget to the empty Region. Use the dropdown to select the ‘Gym Member Visits’ DataSet created in the first step. Use the Edit Chart form to suit your specific needs. Click on the Configuration tab and select Data. Select the Chart Type as Bar . Use the drop-down to select Y-Axis and define as Count of Members and click on the + button again. The Preview window will update and display the data from the DataSet in a Bar Chart. 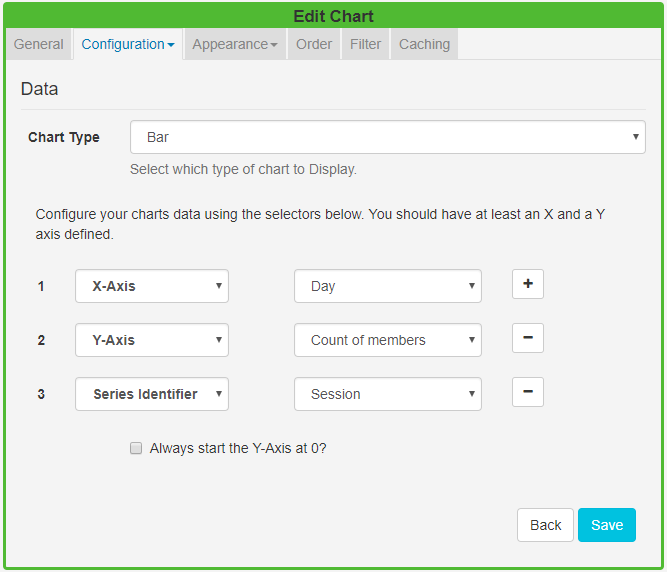 Click again on the Configuration tab and this time select Labels so that we can give the chart some context. Give the Chart a Title and label the X and Y-Axis to be displayed. Tick to Show legend and choose where this should be positioned on the chart. Now we can Style and Colour the chart from the Appearance tab. Select an optional background colour for your chart. Choose a Font Colour to complement the background colour. Set the Font Size for all text contained within your chart. Use the Colour Palette to select the colouring to apply to the charts data series. I have selected 3 different colours to clearly show my Morning/Afternoon/Evening data in my chart. TIP: DataSet results can be filtered by any column by using the clause builder to only include/omit your DataSet results based on your chosen criteria. Using the Filter tab you could apply a filter to only show by ‘Day’ and or ‘Session’ for example. Click on the background of the Layout Navigator and click on the play button to Preview the Layout. Publish the Layout using the button on the bottom toolbar so it is ready to be scheduled to Displays/Display Groups. If you edit the data contained in the DataSet your changes will be available in the system straight away ready to be picked up by the clients on their next collection, with no need to edit the Layout itself!